“Most coaches preach that playing with discipline, taking good shots, and playing good defense, you maximize your chances of winning. It has been the foundation of sound fundamental basketball for over a century. Get the most out of your possessions and if you play lockdown defense, you will go far. What if I were to tell you that if you did the exact opposite of that, you might be able to win? It may not sound too far fetched now, but 25 years later, it would revolutionize the game. A lot of credit goes to one man-‘The Guru of Go’ himself, Paul Westhead. The fundamental idea of ‘The System’ is to create a vigorous pace that will catch the other team off guard and leave them gasping for air by the time the 4th quarter hits. Westhead’s variation seeks to put up a shot in the first 10 seconds of the shot clock, with 3-point attempts encouraged. Also known as ‘controlled chaos,’ the fast pace changes the game altogether, hopefully taking the other team out of their element. It may look to some more like a track meet more than a basketball game because of the amount of running involved. Along with the scoring frenzy, a full court press is employed throughout the entire game to create turnovers and convert those into points off fast breaks. Overall, defense often gets sacrificed in favor of maintaining the pace, ideally leaving the team creating the tempo with more points. With the right players in ‘The System’, wins can be counted up and records can be broken. 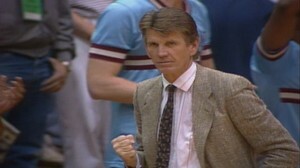 No other coach in the history of basketball has proven this better than Westhead. Starting out as head coach of the La Salle Explorers from 1970-79, Westhead led the team to a pair of NCAA births before becoming an assistant for the Los Angeles Lakers. Upon arrival, Westhead took the helm of a talented Laker team 14 games into the season after then head coach Jack McKinney went down in a injurious bike accident. The Lakers starred NBA legend Kareem Abdul-Jabbar and a 6’9” rookie point guard by the name of Earvin ‘Magic’ Johnson. During the 1980 season, the Lakers won 60 games and made it to the NBA Finals. Against Dr. J and Philadelphia 76ers, the Lakers took a 3-2 series lead, but lost star center Abdul-Jabbar to an ankle injury, leaving him unable to play in a critical Game 6. It was then that Westhead dared to start Johnson at center, and was it ever a gamble that paid off. In Game 6, point guard ‘Magic’ Johnson compiled 42 points, 15 rebounds and 7 assists in a win from the center position, seemingly playing every position on the floor throughout the game. The Lakers won the 1980 NBA Title, thanks to Westhead’s vision and Johnson’s ‘Finals MVP’ performance. Shortly after the beginning of his 3rd season, Westhead was forced out as head coach after a slow start. 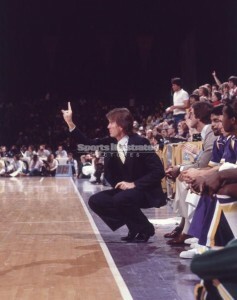 Johnson complained that Westhead’s offense was too predictable and slowed down the Lakers. As you will read later, this is a statement that’s hard to believe in retrospect. In the ’82 season, Westhead coached a year for the Chicago Bulls without nearly the same level of success, finishing 28-54 a couple years before the Michael Jordan era. Perhaps a blessing in disguise, he was offered the head coaching position for the Loyola Marymount Lions a few years later. While at the West Coast Conference small school, he began to put ‘The System’ into effect. The Lions started off slow in his first couple seasons, but then immaculately given a gift that changed the college landscape. 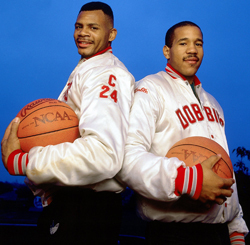 Transfers Hank Gathers and Bo Kimble were both touted players who were unhappy with the USC program and looking for a new start with a different college. Westhead talked them into coming to Loyola, and it started a basketball revolution that made the fast paced system what it is today. With Kimble and Gathers, Loyola Marymount went 27-3 and 20-10 in their sophomore and junior season. In 1988, they advanced to the 2nd round of the NCAA Tournament and in ’89 were a first round exit. In Kimble and Gather’s 1990 senior season, there was a lot of hype surrounding the team. The Loyola Marymount Lions set the all-time NCAA record for points per game with an average of 122.4 per contest. They set the NCAA Tournament single game scoring record with 149 points in a win against Michigan. They are among the all-time top 5 scoring games in NCAA history, with numbers like 157, 152, 150, 149 and 145 point games. In the record books, their name is riddled with entries for most assists, 3 point field goal attempts and makes, and points scored in games. With all the hype in college basketball, the team looked like a serious contender to win an NCAA title. That 1990 season, Bo Kimble led the NCAA in scoring with 35 points per game and Gathers was putting up nearly 33 points and 14 rebounds. Both Kimble and Gathers were looking like top notch NBA prospects and running the WCC. In a 1989 December home game, Gathers collapsed on court and was diagnosed with an abnormal heartbeat shortly after. He was allowed to continue playing but was prescribed medication to counteract the effects. However, he complained that the drugs made him feel slow on the court and drastically impacted his performance. He limited the dosage on the medication in favor of playing at a higher level. In a WCC Tournament quarter final game against the Portland Pilots, Gathers collapsed again. He was immediately transported to the local hospital and pronounced ‘dead on arrival.’ It was one of the saddest and darkest moments in college basketball. The 1990 WCC was called off and LMU was given the automatic bid because of their regular season title. As the 11 seed in the tournament, they made an inspiring run to the Elite Eight, knocking off returning champion Michigan in the 2nd round and losing to the eventual champions in UNLV. The most magical moment of the tournament was when Bo Kimble shot and made his free throws left handed, in honor of Gathers. Gathers was a notoriously bad free throw shooter who was right handed, but tried shooting lefty throughout his career to improve his percentages. After that inspired run through the tournament, there was fallout and controversy surrounding the death of Gathers, and Westhead left LMU for the NBA. Now the coach of the Denver Nuggets, Westhead looked to shake up the league with ‘Paul Ball’ and hopefully have similar success to what happened at LMU. The Nuggets led the NBA in scoring with 120 points per game in 1990-91. Unfortunately, they also gave up an NBA record that season of 130 points per contest. They also gave up an NBA record 107 points in a half, earning the nickname ‘Enver Nuggets’ because of their lack of ‘D’. Compiling a final record of 44-120, Westhead was released from his coaching duties. ‘The System’ is a basketball extreme that does not work in the professional ranks, similar to how the ‘the spread offense’ and ‘option’ being effective in college football don’t work in the NFL. NBA players are too athletic, conditioned, and talented to be full court pressed and outpaced for a full 48 minutes, making you pay on the offensive end for your lack of defense. Don Nelson is one of the winningest coaches in NBA history, using small ball (Nellie ball) as a scheme to get regular season wins, but has never worked out in the playoffs. Nor has Nelson ever made it to the NBA finals as a head coach. Current New York Knicks coach Mike D’Antoni runs a variation of run and gun offense, but don’t expect any titles from him anytime soon. His best shot to win a title was in Phoenix, but the defensive inabilities of his Suns proved to be their biggest downfall in the playoffs. The coach who may have found an answer to the run and gun in the NBA is D’Antoni’s replacement in Phoenix, Alvin Gentry. He noted that if you play to the rhythm of the game, as opposed to the pace, then the team can not only still get more possessions, but more points out of the possessions on a regular basis. Instead of putting up shots in under 7 seconds, you scale it back to about 12 seconds, and are still able to have success with more of a defensive emphasis. It paid off, as the Suns made it to the Western Conference Finals in Gentry’s first full season, losing in a 6 game series that was decided by an outlandish Ron Artest play. 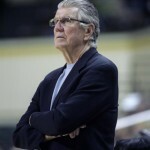 Westhead tried to reestablish his presence in the college ranks during a 4-year stint with George Mason, but was largely unsuccessful at 38-70. From there, he was an ABA coach for a season, head coach over in Japan’s pro league for a couple years, and an assistant for the Orlando Magic from 2003-05. In 2005, he became head coach of the Phoenix Mercury in the WNBA, trying his luck with women’s basketball. 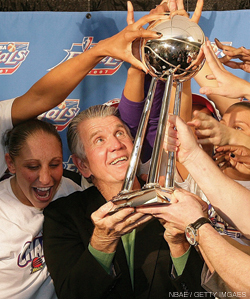 With stars Diana Taurasi and Cappie Pondexter, the Mercury won the 2007 WNBA Title, making Westhead the only coach in history with an NBA and WNBA title to his name. Along the way, he set the WNBA record for team scoring in a season, along with the 2nd highest point game in history (112). However, in ’07 he resigned his post to return to the NBA as an assistant for PJ Carlisimo with the Sonics/Thunder for a couple of seasons. 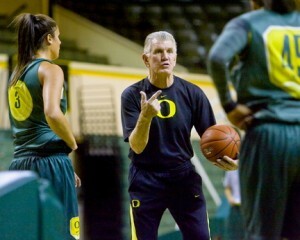 In 2009, he became head coach of the University of Oregon Women’s team. In his first season with the Ducks, he has already broken the school record for points scored in a season, in addition to most 3 pointers made by a team in Pac-10 history. Guard Taylor Lilley lead the NCAA in 3 pointers made with 124, which broke the Pac-10 record for 3’s in a season. The Ducks also lead the Pac-10 in scoring, but were amongst the league lead in points given up per game. They play an exciting brand of basketball that has energized the Oregon fan base. Some even called for Westhead to be considered as a replacement for the men’s head coach during Oregon’s recent search. To this day, the influence of the 71 year old Westhead and ‘The System’ is everywhere in basketball. I credit him with spawning the latest trends of playing fast and increased emphasis on the 3. North Carolina, Kansas, Kentucky, and numerous other NCAA programs run a brand of basketball influenced by ‘The System’. Although not as extreme, there are numerous adaptations that can be seen through the ranks. Of note, Division III program College of the Redlands runs a variation that has set numerous NCAA records. They execute ‘The System’ to a tee by running the entire game, shooting 3’s early in the shot clock, and subbing in 5 at a time to keep their players on the floor fresh to maintain the tempo. In 2005, Redlands upped the ante, averaging 132 points per game. The Redlands are littered throughout the Division III record books as well. If you want to know more about Paul Westhead, I highly recommend the ESPN 30 for 30 documentary ‘The Guru of Go.’ Although before my time, he is someone that I have always admired in basketball. Westhead dared to be different and unconventional. He was truly before his time, changing the game and how it’s played. ‘The System’ is not played by every team to the same extreme of how he runs it, but Westhead is truly an innovator for inducing the style. He demonstrated that if the right pieces are in place to run it, ‘The System’ can be truly unstoppable. He has proven this at more than one level, winning titles in multiple ranks. There are extreme highs and lows to ‘The System,’ but it’s an enjoyable roller coaster ride.